Petrol Pump Dealership Procedure: At this moment of time a petrol pump is a very lucrative business. Petrol Pump Dealership is the first thing you need if you're looking to set up a petrol pump in your area. There has been a major change to the eligibility criteria for Petrol Pump Dealership to what it used to be earlier. Now it is very easy for anyone to get Petrol Pump Dealership which is pretty much hassle-free and a quick procedure. As the number of vehicles on the road are getting increase the oil companies want to expand the number of petrol pumps all over the country and this is the right time for anyone who wants to give a shot to this business. The oil companies are now looking to set up more than 60,000 Petrol pump all over India looking at the demand of the oil needed on a daily basis. To get started you will need a Petrol Pump Dealership from an oil company. But where to start and how to get a petrol pump dealership are the questions you might be wondering. To put a rest to all those queries regarding Petrol Pump Dealership in this article we will provide Petrol Pump Dealership Eligibility and Full Procedure for you to easily get started with this lucrative and remunerative business. As the Government of India plans to get rid of the unemployment problems in India the expansion and opening of petrol new petrol pump all over the country will play a major role. 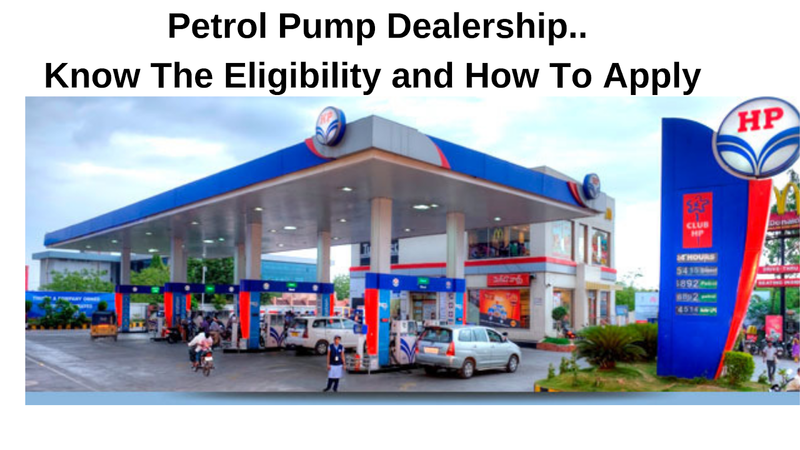 It has now changed the complete eligibility criteria and the major rules in order to make the process of acquiring the petrol Pump Dealership very easy than what was before. All the information related to the petrol Pump Dealership and major changes in rules is discussed below in details. Now you don't need to have a huge requirement for getting petrol Pump Dealership and with only a few easy and little requirements you can easily get the petrol Pump Dealership. In order to acquire the dealership, you need to fulfill only three major requirements that are given below. As per the new procedure, there are now two stages for acquiring Petrol Pump Dealership and in order to get to the next stage, you must pass the first stage. Applicants residing in the rural areas and belonging to the ST/SC/OBC categories must have to be at least 10th pass from a relevant institute. For General category applicants 12th pass is mandatory. You must provide a photocopy of class 10th mark sheet in order to prove your correct age. For acquiring Petrol Pump Dealership in the urban area the applicant must have a minimum of Graduate degree. On our research about Petrol Pump Dealership process we got to know that there are two types of petrol pumps business model- CODO which means Company Owned Dealer Operated and DODO - Dealer Owned Dealer Operated. In a CODO type, you don't incur much expense as you only have to provide the land and all the other investments and expenses are borne by the oil company. While in DODO Petrol pumps all the expenses and investments including the land, acquisition of machinery, staff room construction and all the other expenses are born by the dealer. Coming to the fund for opening a petrol pump you will need a minimum of Rs. 12 Lakh in the rural area, but for starting a petrol pump in the urban area a minimum of Rs. 25 Lakh will be required. It is to be noted that these rupees can be of different forms. Note: Only 60% of the value of the share, bonds and mutual will be treated as the fund. The most important requirement for opening a petrol pump is Land. It doesn't matter whether you own the land or you can take it on lease for a minimum time period. If the land is taken on a lease you have to a NOC (Non-objection certificate) to make sure that the owner has no objection if a petrol pump is opened on his land. Along with this you also have to provide other documents that will be mentioned in the notification. The oil company will inspect closely the location to scrutinize whether the location will help in generating more sales or not before handing out the Petrol Pump Dealership. For opening a petrol pump near the National Highway or State Highway 1200 to 1600 square meters of land is required. If you wish to start a petrol pump in the busy township area the land required is 800 square meter. These are also the most preferred location of the oil companies for opening a petrol pump as these areas will generate more sales compared to other location. Currently, the license fee for petrol pump is INR 18/KL for Motor Spirit and INR 16/KL for High-Speed Diesel for dealer-owned “B” / “DC” site Retail Outlets and INR 48/KL for Motor Speed and INR 41/KL for High-Speed Diesel for a corporation owned “A” / “CC” site Retail Outlets. The application fee For Opening A Petrol Pump varies from one location to another. For a petrol pump in urban areas, the application fee is Rs.10000 and for For Opening A Petrol Pump in the rural area you pay an application fee of Rs.1000. If you belong to the ST/SC categories you can further get an exemption of 50% of the application fee. The payment needs to be done through a demand draft which is non-refundable at any cost. How To Apply For A Petrol Pump Dealership? For opening a new petrol pump you can easily apply online for the Petrol Pump Dealership by following the steps mentioned below. Read all the steps carefully as it is a very complex process. For applying the Petrol Pump Dealership you have to visit a website where you can easily apply for the dealership. Click here to go to the website. After visiting the website the second step for you is to get registered. At the top right you'll find the register now button and by clicking the button and after filling all the details asked where you can get registered. It is advisable that you must read all the brochure in details and all the information given on the website before you get registered. You've to enter all the details in the form and once you fill up everything you will get a One-time password (OTP) which you need to enter to proceed further. After you enter the One-time password (OTP) and hit submit you'll be redirected to the applicant login page where you need to enter your login credentials. The password will be sent to the email id which you have entered in the registration form. After finding the password, enter the email id and password along with the captcha code and hit the submit button. This will bring you to another page. After you log in to your account you'll be taken to the applicant dashboard page where all the details about your profile can be found. Here you will also find the available advertisement right after you hit the log in button. By clicking the button you'll be able to find all the advertisements of the oil companies for opening a petrol pump throughout the country. After finding out the advertisement section you will see all the advertisement the oil company has released throughout the country. Now if you want to find an exact area where you want to open a petrol pump and to see whether that location is available you can filter the search and according to your area, you can apply Petrol Pump Dealership in that particular area. After you have selected the location in which you want to apply the Petrol Pump Dealership you will now have to fill all your personal details such as your marital status, qualification, and the board/institution name as well as the land details. Enter all the correct information and after filling up all the information you need to upload your recent photo and signature before you can proceed to pay the application fee. After you hit the submit button you'll be redirected to the payment page where you can pay the fee. You can pay the amount through debit or credit card and net banking. After completion of all the steps mentioned above, you will complete the application process for the petrol pump dealership. The oil companies will now inspect all the documents you provide and land along with the NOC certificate and lease agreement. If they are satisfied with all the legal documents they will pass your application. If the oil company receives a large number of applications, it announces the name of the winner through the lottery system.